By Nynke van Dijck Some weeks ago there was a big storm in the Netherlands. ‘Code Orange’ was issued to tell people to be careful while going on the road or making use of public transport. 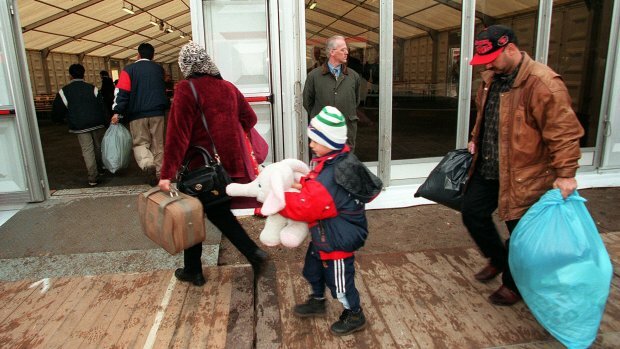 In the south of the Netherlands, in a city called Nijmegen, a new refugee camp was built which was supposed to host around 800 people from countries like Syria, Afghanistan and Eritrea. When the weather got worse, the tents in the camp were shaking, water was leaking through the roof and a loud alarm was going off the whole night. No one in the camp could sleep and the shelter administration (COA) was not reachable. After a long night, in which the refugees posted a lot on Facebook about what was going on, one of the refugees was done with the whole situation. He apparently could not take it anymore, living without privacy and having only interaction with other refugees. He climbed on the roof of a radio tower in the camp and threatened to kill himself. Interestingly, in this shocking event the relation between public and private sphere are important to understand what is going on. Richard Sennett tells us is that the public realm is a process, and a place where strangers meet. Most important about the public realm is what happens in it. The refugee camp can on the one hand not be seen as a public realm, but on the other hand it can. For people from Nijmegen or somewhere else in the Netherlands it is very difficult to enter the camp. They have to ask permission from the COA, show their ID and pass a lot of bureaucracy. On the other hand it is a place where strangers meet, because most of the refugees are from different places or have been in other camps in the Netherlands before. This is closer to how anthropologist Thijl Sunier sees the public sphere, namely as a space that is created through unequal status because it is dominated by middle-class conventions about style. In this respect, the COA and the Dutch government who make the rules in the camp can be seen as ‘the middle-class’. The COA is using their status and power over the refugees to make the rules in the camp. Some of the refugees made the choice to leave the camp and sleep in a hotel that evening. They chose both freedom and security. On the one hand they did not want to be in the camp while it was storming during the night. On the other hand they also made the choice for security, because they did not feel safe in the tents. One does not always have to make one choice over the other. Some refugees are protesting against the situation and the stress they have to endure. This protest can be seen as emancipation; in terms of Sunier this is a process in which a minority group attempts to claim a place within a nation-state, thereby developing a certain political consciousness. Not only the refugees are organizing these protests, also inhabitants of Nijmegen and the rest of the Netherlands are protesting, for example on Facebook-pages such as ‘Refugees in the Netherlands Nijmegen’. This Facebook-page is an online community where refugees meet Dutch people, who invite them for diner, take them out for a daytrip or give them donations, such as clothes. The anthropologist Oscar Verkaaik states that identity is a process of objectification, for example the objectification of spaces. Engagement with and creation of spaces help us to identify with it. What Verkaaik is saying here is very prevalent in the case of Nijmegen and many more camps in the Netherlands and around the world. Because the refugees are not allowed to make the camp ‘their own’, by for example hanging pictures on the wall, it is difficult for them to identify with the space of the camp. More and more projects by volunteers are now, because of this situation, focusing on making the camps feel like a ‘home’ – a place where refugees feel more comfortable, secure, and where there is interaction between them and Dutch people. In this way the camps can be a border in the way Sennett suggests: as zones in a social environment where people become more interactive due to the meeting of different groups. The man came down from the tower after a couple of hours. He made his statement and for that moment this was enough for him. This was clearly more than a cry for help. Anthropology can show us how to understand this and think of ways to improve these sorts of situations. As anthropologists we have the duty to do so and spread our knowledge. Nynke van Dijck is a Master’s student in Social and Cultural Anthropology. She has done research on Kurdish identity in Istanbul, and is a volunteer in a refugee center.